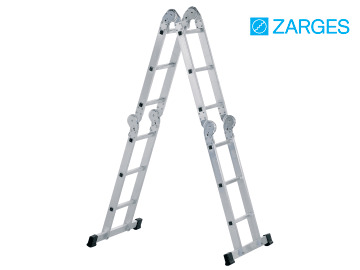 The Zarges Multi-Purpose Ladders cover a multitude of uses with compact transport dimensions. 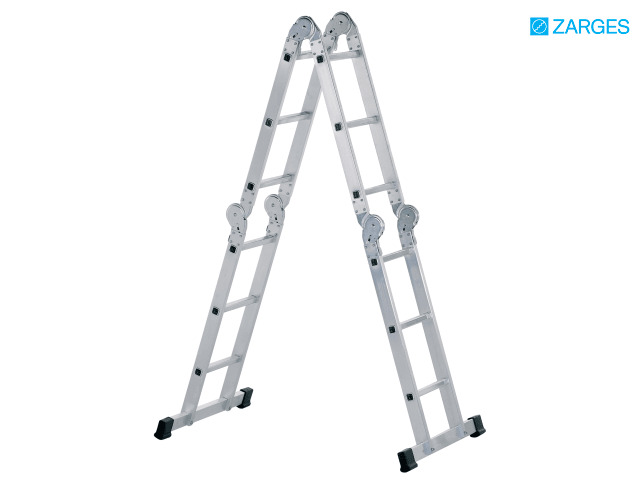 The ladder can be used as a lean-to ladder with or without support, a stepladder which can be ascended from both sides, or as a practical working platform. It is easy to transport with four folding sections. The multi-purpose ladded is manufactured from high strength aluminium extrusion, with side rails for maximum stability. It has replaceable 2-component plastic end caps to ensure positioning without risk of slipping, and high-strength ZARGES quality flanged connection between rungs and stiles for extra safety. External width of ladder body: 350 mm. Conforms to EN 131 standards, 150 Kilo rating, and has a 10 year guarantee. Number of rungs: 2 x 3, 2 x 5. Dimensions folded: 745 x 1490 x 275mm. Length as lean-to ladder: 4.74m. Delivered Direct to Business, Site or Home; please note a carriage surcharge may apply dependent on the delivery address, contact us for further details.